This month’s newsletter contains announcements from the Secretariat of IPSI’s participation in upcoming meetings related to the CBD, and also information on a recent resilience assessment workshop in the Philippines and an event held during the 4th World Congress of Biosphere Reserves in Lima, Peru. We also have a short announcement of an article including IPSI and two calls for submissions, one for indigenous and local knowledge (ILK) for IPBES, and a call for applications for a workshop to be held in Japan in September. We are also pleased to provide introductions to a new IPSI member, the Kenya Forestry Research Institute, and a recent case study from the Forest Peoples Programme and its partners. The IPSI Secretariat is looking forward to taking part in two upcoming meetings under the processes of the Convention on Biological Diversity (CBD): the Twentieth Meeting of the Subsidiary Body on Scientific, Technical and Technological Advice (SBSTTA-20) from 25 to 30 April, and the First Meeting of the Subsidiary Body on Implementation (SBI-1) from 2 to 6 May in Montreal, Canada. We hope that any IPSI partners who will be at these meetings will be able to attend the side events. Also, please take the time to write a quick message and let us know if you will be there, as we hope to meet up with many IPSI partners while we are in Montreal. An assessment workshop using the “Toolkit for the Indicators of Resilience in Socio-ecological Production Landscape and Seascapes (SEPLS)” was held in Barangay Pancol, Municipality of Taytay, Palawan, Philippines, on 23 March 2016, with support from the United Nations University Institute for the Advanced Study of Sustainability (UNU-IAS) and led by one of its graduate students. This was the first time the Toolkit has been used in the Philippines. The goal of the workshop was to draw insights and provide guidance for protected area (PA) planning and management in the Philippine context. It focused on the Malampaya Sound Protected Landscape and Seascape (MSPLS) and was conducted in collaboration with Taytay’s Community Environment and Natural Resources Office (CENRO) under the Philippines’ Department of Environment and Natural Resources (DENR). The workshop included: (1) a participatory mapping exercise; (2) identification of ecosystem services and trend analysis; (3) timeline analysis to determine past environmental events; and (4) landscape and seascape resilience indicators scoring and discussion. Data gathered from the workshop will serve as baseline information in exploring socio-ecological resilience and ecosystem service assessments as a mechanism to enhance protected area management and planning. Final results will be provided to the communities and stakeholders after critical analysis of the collected outputs. To download the Toolkit for the Indicators of Resilience in SEPLS, which was developed as a part of collaborative activities under IPSI, please click here. The 4th World Congress of Biosphere Reserves was held from 14 to 17 March in Lima, Peru, organized by IPSI-related organizations UNESCO’s Secretariat of the Man and Biosphere Programme (MAB), the Ministry of Environment of Peru (MINAM) and its National Service of Natural Areas Protected by the State (SERNANP), and the MAB National Committee of Peru. IPSI Secretariat staff members were happy to see many representatives of IPSI partners and friends attending the Congress. IPSI and the Satoyama Initiative were featured at a side event to the Congress, titled “Synergies between Multi-designations in Biosphere Reserves”, and organized by Dr. Hiroyuki Matsuda of the MAB National Committee of Japan. The event included presentations from IPSI members UNESCO, the University of Tokyo, and the United Nations University Institute for the Advanced Study of Sustainability, along with others working in areas with close affinity to the Satoyama Initiative. Mr. William Dunbar of the IPSI Secretariat served as event rapporteur along with vice-rapporteur Dr. Toshinori Tanaka from the University of Tokyo. The event focused mainly on designated MAB Biosphere Reserves that are also share designations under other programmes, such as National Parks, Geoparks, Ramsar sites and others. Presenters shared their experiences, noting that there are some difficulties such as increased reporting and monitoring requirements, but also advantages both in terms of promotion and conservation. One main conclusion was that streamlined co-management is key to reduce labor and enhance benefits from multiple designations. An article was recently published in the United Nations University’s online magazine “Our World”, titled “Conserving Resilient and Multifunctional Sustainable Landscapes”, and written by Dr. Evonne Yiu and the IPSI Secretariat’s own Dr. Kaoru Ichikawa. The article contains a lot of information about the Satoyama Initiative and IPSI’s activities, as well as related work integrating the Globally Important Agricultural Heritage Systems (GIAHS) Partnership Initiative. It provides a good introduction to Satoyama Initiative concepts, and the IPSI Secretariat highly recommends that readers share it among any colleagues who may be interested. The article can be found on the Our World website here. The Intergovernmental Platform on Biodiversity and Ecosystem Services (IPBES) recently circulated a call for submissions for examples of indigenous and local knowledge (ILK) relevant to its Asia-Pacific region assessment of biodiversity and ecosystem services. The Asia-Pacific assessment address the interrelationships between biological diversity and society, including nature’s benefits to people, as well as human well-being. It focuses on changes that affect food, water, energy, livelihoods and health. It also considers the importance of biodiversity for social relationships, spirituality and cultural identity, and addresses issues of equity, including inter- and intra-generational equity. If any readers have relevant indigenous and local knowledge (ILK) to contribute, or if you know of projects or publications on ILK and biodiversity, its benefits for and relationships with local communities and indigenous peoples, we encourage you to consider making a submission. The Call for Submissions and more information can be found on the UNESCO website here. The IPSI Secretariat recently received word of a call for applications for a workshop titled “Capacity Building Workshop on Nature-Culture Linkages in Heritage Conservation in Asia and the Pacific (CBWNCL)”, to be held from 18-30 September 2016 at the University of Tsukuba in Japan. The purpose of the workshop is to contribute to the World Heritage Capacity Building Programme led by ICCROM and IUCN, in consultation with ICOMOS and the UNESCO World Heritage Centre, in developing new approaches towards integrated conservation of cultural and natural heritage. The workshop is open to 15 young professionals from Asia and the Pacific region involved in the management of cultural or natural heritage sites, specifically, agricultural landscapes. Mid-career Heritage Practitioners with minimum of 5 years of experience from both natural and cultural heritage sectors currently engaged in managing/working with agricultural landscapes in particular and natural heritage sites with cultural values and vice versa are eligible to apply. The call for applications is open until 29 April. For more information, please see the website here. Among the new members welcomed into the IPSI partnership at the last meeting of the IPSI Steering Committee is the Kenya Forestry Research Institute (KEFRI), with headquarters in Nairobi. The mandate of KEFRI is to undertake research in forestry and allied natural resources disseminate research findings; and establish partnerships and cooperate with other research organizations and institutions of higher learning in joint research and training. The institute conducts research and development activities under five thematic areas namely: Forest productivity and Improvement; Biodiversity and Environment Management; Forest Products Development; Social-economics, Policy and Governance and Technical Support Services. The Institute’s research is tailor-made to address the unique needs of the various Eco-regions in Kenya hence it has 5 regional research programmes. These include; Central Highlands Eco-region Research Programme, Rift-Valley Eco-region Research Programme, Drylands Eco-region Research Programme, Lake Basin Eco-region Research Programme and Coast Eco-region Research Programme. The Eco-region research programmes have head offices in Muguga, Londiani, Kitui, Maseno and Gede respectively. The Institute also has 1 national Forest Product Research centre located in Karura. More information can be found on KEFRI’s website here. The IPSI Secretariat actually received this case study report from partner organization the Forest Peoples Programme (FPP) – along with non-member the South Central People’s Development Organisation – among the founding materials for the partnership, but only recently managed to include it in our official list of IPSI case studies. We are happy to finally be able to share it publicly with our members and friends, as it contains a great deal of rich information that has helped to guide IPSI into the successful partnership it is today. 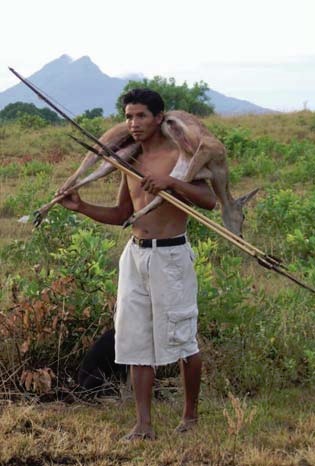 This study summarizes how the Wapichan people in Guyana (South America) customarily use biological resources within their traditional territory in the South Rupununi, and explores the opportunities and challenges relating to effective implementation of article 10(c) of the CBD at the local and national level. The study is based on 4 month’s fieldwork undertaken by a team of eight Wapichan researchers in 16 villages and numerous smaller settlements in the South Rupununi District. The study finds that the Wapichan kaduzu “custom” includes a rich body of norms and beliefs that promote the “sensible” use of land and natural resources. Customary law contains rules against overharvesting and strongly condemns wasteful activities, while traditional practices promote selective and rotational resource use to enable re-growth and regeneration. Respectful and measured resource use is underpinned by a shared sense of responsibility regarding the need to care for resources for future generations and a strong belief that all life forms have their own spirit grandfather or “keeper” that must be respected by humans.